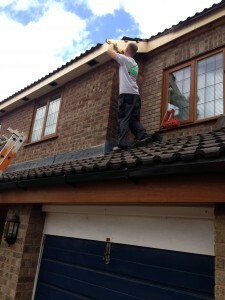 JT Roofing offer a complete Facia and Soffit fitting service at a cost to suit your budget. JT Roofing will not cover your existing facias by just nailling on to the existing timbers. Whilst this is cheaper and easier to install the new covers can then trap moisture against the timbers and then hide the damage being done. Call JT Roofing now on 07999 254992 for a free quotation. Low maintenance UPVC Facias, Soffits & Guttering are a must. JT Roofing will always where necessary replace the facias and soffits because the existing material is showing signs of rotting or damage, we would remove the existing material usually wood and replace with the modernUPVC materials. New UPVC facias fitted correctly are pretty much maintenance free and will last 20 -30 years.